Having sewn since I was very young, I learned to quilt while volunteering for a school project for my son’s kindergarten class. As soon as I turned to machine quilting to finish my quilts, I was hooked! After taking classes from many talented quilters, and especially inspired by Diane Gaudynski, I am passionate about machine quilting quilts of all sizes – all on my home sewing machine. Second Place, Small Pieced Quilts at the National Quilters Association show in Columbus, Ohio. Second Place, Miniature Quilts at the 2011 National Quilters Association show in Columbus, Ohio. 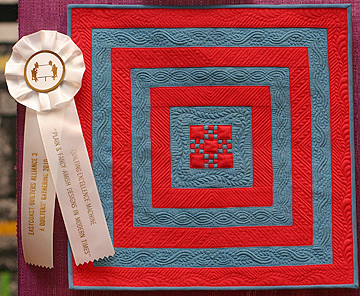 Third Place, Miniature Quilts at the 2011 Houston International Quilt Show. I love to share my passion for machine quilting in workshops and lectures across the country. Members of Farmington Valley Quilters of Connecticut visited the Quilt Museum in Lowell last year and we were very impressed with your work. We’d like to invite you to speak and possibly give a workshop at our guild in the fall of 2010, winter of 2010/2011 or spring of 2011 with focus on trapunto. I have an “official” invitation for you – how would you prefer that I send it and what address shall I use? Hi Meg, thanks very much for your kind words about my work. I enjoyed putting together the small exhibit at the Quilt Museum last spring to share my work. You may contact me directly via my email address diane@dianeloomisquilts.com.